Don’t Judge a Bread by Its Color! Bread is a staple food that most of us eat in some form or another each day. That could be toast for breakfast, a sandwich for lunch or a piece of bread to accompany our soup at dinner. But when we try to lose weight, bread is one of the first foods that we give up because we believe that it is fattening and slows weight loss. But is that really true? If you choose your bread carefully, it can be healthy and low in fat and calories. The average slice of bread has a similar amount of calories and is no more fattening than most fruit. For example, an apple has about 65 calories and an average slice of bread usually has between 60 and 90 calories and one gram of fat or less. And if you choose the light breads, they only run you about 40 calories per slice. So, if you don’t eat too much bread, then giving it up is not really going to give you a large benefit, especially if you choose a healthy bread. That’s what you should focus on first. When buying bread, we usually choose breads that taste good. That’s important, but besides that we should also look at the fiber, minerals and vitamins the bread contains. If you’re eating bread, you want it to be more than empty calories. One of the first things you should check, is if the bread has enough fiber (at least 2 to 3 grams per slice) because the more fiber the bread contains, the healthier it is for you. 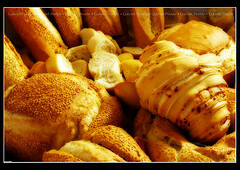 You should also try to choose the bread that has more of the vitamins and minerals that you need. Once you look at the labels, you will be surprised that sometimes a bread which you thought was healthy, doesn’t provide you with anywhere near as much fiber, vitamins and minerals as you had believed. So, it pays to read the nutrition labels carefully. What should I look for when buying bread? White, enriched bread: This bread is made from white flour and has had most of the fiber rich bran and germ removed from the wheat grain. In this process, most of the fiber and nutrients are lost. Even when enriched flour is used, which is flour in which most of the vitamins and some of the minerals are added back, a lot of the fiber and trace minerals are still lost. Wheat bread: Even though it says wheat on the bag, that bread you’re holding may not be as healthy as you think. Most wheat breads are actually made with 75% white flour and only 25% whole wheat flour. Even if the first ingredient on the label is “wheat flour” or “enriched wheat flour,” don’t be fooled. This isn’t truly whole wheat flour. It is actually refined white flour. Looking at the color of the bread is not much help either. Just because a bread is not white in color, doesn’t mean it is truly whole wheat. Some brands are even as sneaky as to use caramel coloring to give them a dark brown color, so that you’ll think they are healthier than they are. And beware of breads that are labeled “wheat bread”, “cracked wheat” or “sprouted wheat.” You will notice that the nutritional profiles of most of them are not much better than white bread. Whole wheat bread: This is the highly nutritious bread you’re looking for. It contains the whole grain, including the fiber-rich germ and bran, which contains all the wonderful nutrients. It is a nutrient dense food that is an excellent source of fiber, iron, folic acid, vitamin E, copper and vitamin B6. The nutrition label will read 100% whole wheat and it should be the first ingredient on the list. And if you are trying to limit calories, make sure that your bread does not contain a heavy amount of honey, brown sugar or molasses which will add extra unnecessary calories. So, the next time you are in the supermarket searching for the right bread, look farther than the color and the buzzwords on the package. Read the labels carefully and choose the 100% whole wheat variety. You will be treated to that good source of fiber, vitamins and minerals that you were looking for. Fantastic insight Talli! Thank you! Don’t forget that you should look for bread with no high-fructose corn syrup in it…which is easier said than done!